Nott and Associates is committed to helping you design and build your custom home. Below are some Home Sense tips that can help educate and guide you through your new home or remodel. 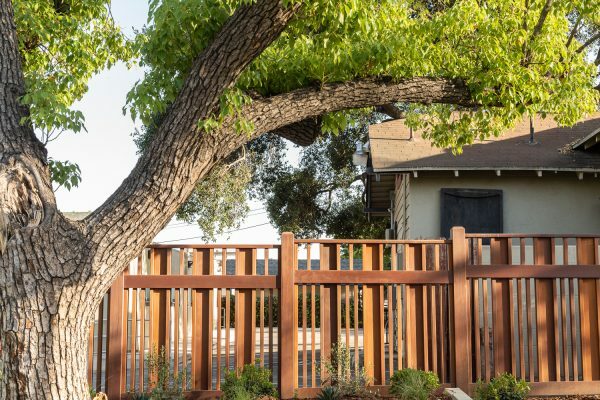 Wood fences are a simple, beautiful and practical part of our home. 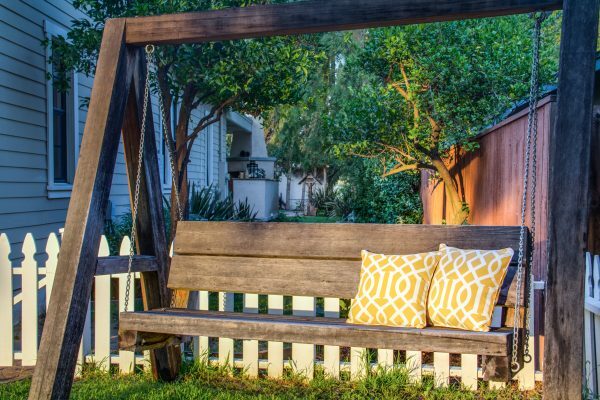 From a decorative front yard picket fence to a fence to hold in a big dog fences come in many styles and serve many purposes. 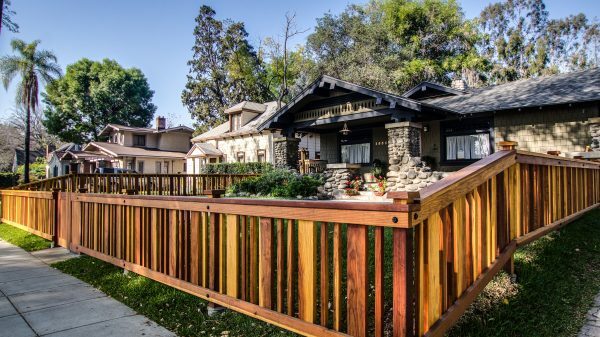 Wood fences can be constructed many ways and of many materials. These decisions early on determine if a fence will last up to 30 years or fall over in 3. 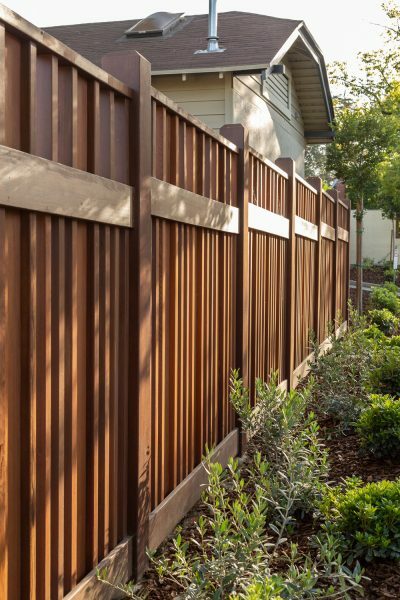 The wood, fasteners and maintence all determine a fence’s lifespan. The most important part of a fence are the posts. Posts come in wood or metal and should be placed in a 24” deep hole filled with concrete or bolted in place. The concrete should come up to at least the level of the soil or even a bit higher to protect the post from the surrounding soil. This is the most critical part of a fence. If the soil comes in contact with a poorly protected post it will fail there first and the entire fence will fail. I have seen this countless times. If possible try get the concrete above grade and slope the top of the concrete away from the post so water runs away from the post. There are many options for wood posts. The gold standard is ‘heart’ redwood. Heart means the post is cut from the center or heart of the Red Wood tree. Heart redwood has fewer knots, is denser and has a high concentration of tannin. The tannin gives the wood the red color and provides it natural resistance to decay. Heart red wood is a specialty product typically only available from a lumber yard. A 4 x 4 x 8’ heart Red Wood post runs about $30 each. Redwood posts that you see in building centers are a combination of ‘heart’ and ‘sap’ wood. This post will be a mix or red and yellow colors. The yellow part is called the ‘sap wood’. The sap wood is cut from further out on the log in the new growth section. It is less dense and has less tannins. This 4 x 4 x 8’ post would run about $20 each. Cedar is another good option. Cedar has similar resistance to red wood but it is a little stronger and less brittle. Cedar will be slightly more expensive than redwood but is used less often because it is not as readily available. A more recent option for posts are Douglas Fir or Yellow Pine pressure treated with a fungicide that contains a variety of copper. The higher the concentration of copper the longer the wood will last but the more corrosive it will be on the fasteners so galvanized fastens are required. The copper gives the wood resistance to fungus and insects like termites. These posts are a good option. They are strong and resist decay but they typically covered in small dents from the preservative process. Many people don’t like the appearance of these dents. An issue with these posts is the preservative is not present all the way through the board. When the wood is cut you expose the non treated wood. The cut ends should be painted with the preservative but few builders take the extra step. Pressure treated posts run about $15/ EACH. The worst option is non treated Douglas Fir. These posts will last as little as 3 years dependent on their contact with soil and their exposure to moisture. Homeowners and handymen commonly make this mistake because Douglas Fir is a commonly available and cheaper. A Douglas fir post runs about $10. Another option are metal posts. Metal posts vary tremendously in quality and the installation process. The quality of the metal used and how it is protected or galvanized will affect how long your fence will last. The posts you buy at home centers are usually thin metal and have a poor protective coating. These lesser posts can rust out in 10 years. A better option I like are galvanized 2” plumbing pipe that can last 40 years but costs significantly more and is harder to work with. I always recommend galvanized protection for metal posts and all fasteners. Metal is galvanized in two ways. Electrco galvanizing where the metal is exposed to an electrical charge then a zinc coating sticks to the metal or hot dipped galvanized where the metal is actually dipped in molten zinc. The hot dipped process produces a significantly thicker protective coating than electro galvanized. Hot dipped is less commonly available than electrogalvanized but if you can find it use it. You won’t be sorry. The cost of metal posts vary tremendously based on many factors. The next most important thing part of the fence is the fence frame. Heart red wood again is the best option flowed by sap redwood then Douglas fir. The wood frame should be at least 8” above ground away from soil. Be sure to seal all surfaces of the fence with primer or wood sealer before you start. Next are the fasteners you use. Fastens need to be galvanized, hot dipped if available. If you don’t use galvanized fasteners after the first couple rains you will see rust streaks on your fence and the fence will fall apart faster. Always use a nail with a head on it. If ‘Ring Shank’ nails are available use them. Ring shank nails have rings down the spine of the nail which help the nail from pulling out. Never use finish nails when building a fence. Some inexperienced builders and homeowners will use finish nails because finish nails are smaller, cheaper and easier to use then fastens with a head on them. Finish nails work fine in doors but don’t hold up outside at all. Because there is no significant head on the nails when boards are exposed to the elements and the wood swells and contracts and the small heads don’t hold and the boards can come loose. I have seen fences put together with finish nails start coming apart in less than 5 years. What most people think about when they think wood fence are the pickets. Again there are many options. Heart red wood again being the best at about $7 for a 1” x 6” x 6 foot picket. Cedar and sap red wood runs about $4 based on the quality. Some home improvement stores are now selling ‘white wood’ with a preservative stain that looks a little like redwood for just over $2/ picket. Do not use these pickets unless you only need the fence to last a couple years. Now it is time to paint or seal the fence. For a painted fence prime all the lumber before you assemble the fence. This is the best way to make sure the boards are protected where they are in contact with each other. Moisture collects at these unions and starts rotting from the inside out. If you paint the fence after it is assembled you will never get paint where it needs to be at the junctures and unions of the fence. I recommend an oil based primer if you can find it then one coat of paint before you assemble the fence. The wood is much easier to paint when it is lying on the ground in a pile. Painting a fence when it is assembled is challenging. Trying to get paint in the nooks and crannies of the fence and dragging drop cloths all over the yard can be tedious. Priming and painting before you assemble the fence then a final coat at the end will save you time, money and provide good protection for the life of the fence. If you are going to stain the fence use a high quality UV resistant finish like Penofin. Like painting you should get a coat of sealer on the wood then put a second coat on once it is assembled. A fence should be maintained. Fences can have a lifespan of up to 30 years if they are built and maintained correctly. Inspect the fence every couple years for paint that needs attending to or loose boards. Point sprinklers away from the fence. Remove soil that comes in contact with the fence. The soil wood interaction is where most of the deterioration will occur. Existing Fences can be repaired. Sometimes a couple posts will rot prematurely. Many fences can get an extra 5 years of life by just changing a couple posts and adding some fastens where needed. If you see evidence of termites call an exterminator. Formosan subterranean Termites can start with your fence then move to your house. Poison can be injected into the soil near an infestation to reduce this risk. The cost of a fence is based on the material used, the design and who builds it. A typical 6’ tall dog eared redwood fence with all heart wood built by a competent builder should cost about $80 per linear foot. The price will vary based on the length of the fence. A cheap fence built of the wrong material by a lesser builder will cost you less but may only last a few years. Be aware of who you hire to build your fence and ask the right questions. If you hire a builder with the cheapest price he may not be around when your fence falls over in 5 years. I heard a wise man say, “When you buy quality you only cry once”. Ask the right questions and hire the right builder and will get a beautiful long lasting fence.